But most academics accept that it is because of the subatomic particle’s catchier nickname that the world waited with bated breath on the final word on its existence. Scientists at the European Organisation for Nuclear Research (CERN) did not disappoint either. 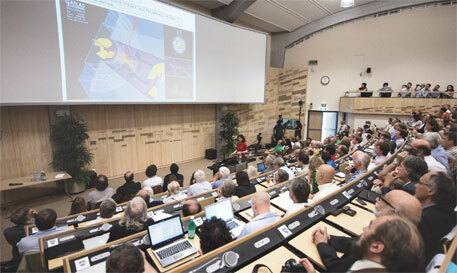 In a conference on July 4, they announced that they have detected a new particle having properties consistent with the long sought-after Higgs boson. The elusive particle is believed to help all matter in the universe acquire mass (see ‘Particle physics basics’). The finding has been more rewarding for India. Not only did it bring Satyendra Nath Bose, the man who defined the properties of bosons (see ‘The unsung hero?’), to limelight, it also made CERN scientists rethink the country’s membership in the organisation. There are talks of making India an associate member of CERN from a non-member “observer” country. “Observer” countries can take part in meetings but not in decision-making. The experiments at CERN to discover Universe’s secrets started in 1954. India joined the league in 1992. The experiments on the Higgs boson began only in 2010. The finding has been aided by researchers from Delhi University, Bhabha Atomic Research Centre, Panjab University, Tata Institute of Fundamental Research (TIFR) in Mumbai and Saha Institute of Nuclear Physics (SINP) in Kolkata. “India has contributed in two major ways—providing instrumentation and human resource for data analysis,” says Naba K Mondal, professor at the department of high energy physics at TIFR. Six experiments are being carried out at the Large Hadron Collider (LHC), a 27-km long and 100m deep tunnel along the French-Swiss border, where scientists are trying to simulate conditions just after the Bing Bang. India has contributed in two of these experiments—Compact Muon Solenoid (CMS) and A Large Ion Collider Experiment (ALICE). CMS is a general-purpose experiment studying subatomic particles, including the Higgs boson. Two components of the CMS experiment have been built by India. ALICE is for studying how states of matter have evolved over time. Theorists from India are constantly looking at the data generated, making sense of it and publishing papers to advance knowledge in the field. The other experiment which is studying the Higgs boson is A Toroidal LHC Apparatus (ATLAS). “Of the 4,000 physicists at CMS, 60 are from India. While this may be a small number, it doesn’t tell the entire story,” says Sukalyan Chattopadhyay, professor at SINP and India’s project leader for ALICE. He adds SINP played a big role in understanding the characteristics of the detectors of CMS. The country has so far shelled out US $92 million towards various experiments at CERN. 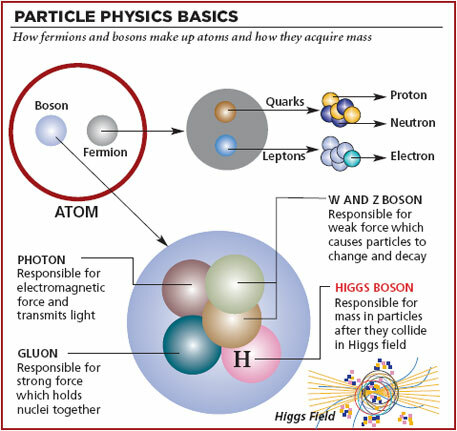 The Standard Model of Particle Physics explains how two elementary particles—fermions and bosons—and their interactions make up all matter and everything that exists around us (see ‘Particle physics basics’). But it is silent on how particles acquire mass. This is where the Higgs boson comes into play. It is a unique boson which has been identified as imparting mass to other particles. English physicist Peter Higgs, after whom the particle is named, and others proposed the Higgs Field theory in 1964. According to the theory, right after the Big Bang, the mega astronomical event that created the universe, the particles that were created had no mass, probably because of extremely high temperatures. However, as the universe evolved and cooled down, the Higgs Field was created which contained the Higgs boson particles. When primordial particles entered this field, they attracted the Higgs boson and gained mass. “Discovery of the Higgs boson will confirm the mechanism by which all elementary particles acquire mass. Without mass the universe would not have formed, there would be no life, there would be no electronics,” says John Gunion, a theorist at University of California-Davis. To catch a glimpse of the Higgs bosons, physicists at LHC, collided two beams of protons at 99.9999991 per cent the speed of light. The collision created a number of particles which were spotted by detectors. The scientists then studied these consequent particles and found the one which had properties consistent with the Higgs boson. But while CERN has confirmed a new particle, it is yet to be established that it is the boson they are looking for. What if it is not the Higgs boson? Andrei Gritsan, an experimental physicist associated with the CMS experiment, says, “We are all sure it is a new boson. It is a boson because only a boson can decay into the final states observed. However, if it is not the “standard” Higgs boson, it is something big and will help in understanding how the world works.” Gritsan adds that it will take CERN the rest of the year to understand the properties of the new boson and publish the results. While the world focusses on the Higgs boson, the particle accelerators used to find the particle have done more good. “Proton therapy used to treat cancer and positron emission tomography (PET) scan are contributions of this accelerator-based research,” says Mondal. Proton therapy treats cancer by focussing a beam of protons directly on the tumor, sparing the surrounding healthy tissue. The beam is delivered using a particle accelerator. PET capitilises on the technology behind detectors used in accelerator systems. In PET, radioactive substances are injected into the body. These are then absorbed by the cancerous tissue, which in turn emits particles that are detected by PET detectors. Computer scientist Tim Berners-Lee invented the World Wide Web while trying to create a system to enable scientists across institutes associated with CERN to share information.